Which is better — brain or computer? It is a question that has been asked countless times and one which has inspired scientists to develop computers that operate less like pre-programmed machines and more like the human brain. With the help of neural networks, programmers are developing solutions that behave in a similar way to the human brain and which have amazing capabilities. Neural networks consist of thousands and millions of artificial "brain cells" or computational units that behave and learn in an incredibly similar way to the human brain. Also known as Artificial Neural Networks (ANNs), neural networks generally consist of software simulations that behave as though they were millions of brain cells interconnected and working in parallel to solve problems, make decisions and recognize patterns just like a human brain can. An artificial neural network processes information in two ways; when it is being trained it is in learning mode and when it puts what it has learned into practice it is in operating mode. For neural networks to learn, they must be told when they do something right or wrong. This feedback process is often called backpropagation and allows the network to modify its behavior so that the output is exactly as intended. In other words, it is trained with many learning examples and eventually learns how to reach the correct output every time, even when it is presented with a new range or set of inputs. Just like a human, an artificial neural network can use past experiences to reach the right conclusion. The feedforward neural network is the most simple of all varieties. Information moves in one direction only and is sent from input nodes directly to output nodes. There are no loops or cycles in this network. Unlike its feedforward cousin, the recurrent neural network allows data to flow bi-directionally. This type of network is a popular choice for pattern recognition applications, such as speech recognition and handwriting solutions. A modular neural network is made up of independent neural networks. Each is given a set of inputs and work together to complete sub-tasks. The final output of the modular neural network is managed by an intermediary that collects data from the individual networks. Convolutional neural networks are primarily used to classify images. For example, they are able to cluster similar photos and identify specific objects within a scene, including faces, street signs and individuals. We are seeing more and more of these networks in use across many applications, from social media apps to healthcare diagnostics solutions. Neural networks are used for a range of different applications, but their ability to make simple and accurate decisions and recognize patterns makes them the perfect fit for specific industries. For example, in an airplane, a basic autopilot program may use a neural network to read and process signals from cockpit instruments. These signals can then be used to modify the airplane's controls and keep it safely on course. In manufacturing, a neural network can be used in a detergent factory to ensure that all products are created to the same high standard by measuring pre-programmed elements such as acidity, color and texture. If a batch doesn't achieve the right measurements, the neural network rejects it. Neural networks are often the perfect candidate for applications and processes that rely on security, too. For example, a bank processing thousands of credit card transactions may need an automated method of identifying fraudulent transactions. With enough pre-programmed fraudulent activity inputs and clues, a neural network would be able to flag any suspicious activity instantly and also take necessary action such as alerting the customer and key staff or instantly freezing the card. While they may not be able to fully emulate the human brain, neural networks are certainly capable of generating many of the logical processes a human brain exhibits and are bringing huge opportunities and insights to many industries. For this type of network to operate efficiently and successfully, it must be secure. 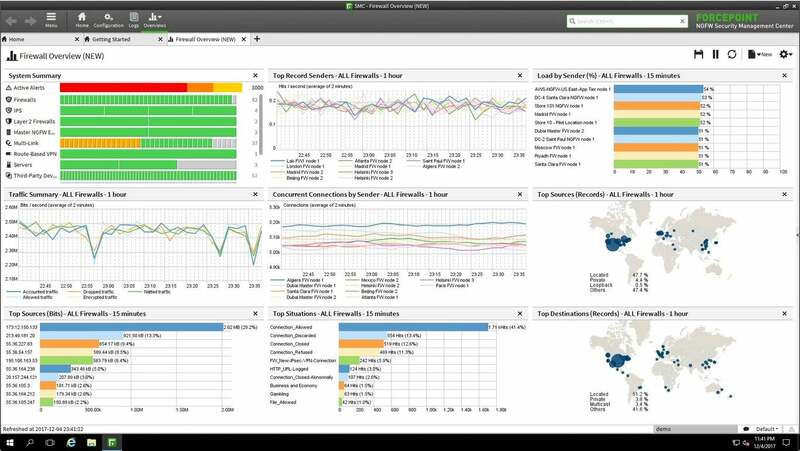 Forcepoint's Next Generation Firewall is designed to not only protect your network from unauthorized access and the latest cyber threats, but will also give you complete visibility and control with its visual, interactive interface.